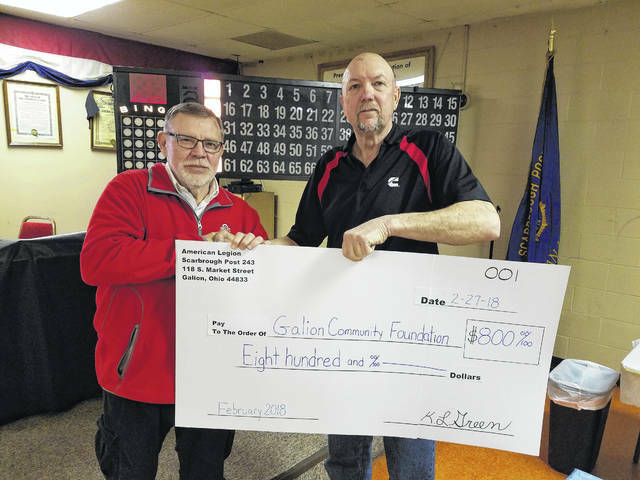 GALION — American Legion Scarbrough Post 243 is getting back to the basics to better serve the needs of Galion and the surrounding area. The American Legion was established by Congress in 1919 to not only take care of veterans, but families and communities also. The American Legion organization has long been a significant fundraiser for charity. This year, Galion Scarbrough Post 243 made some small changes in internal processes, got increased involvement by several members, and found they could do much more for Galion than in the recent past. Bingo began again for the first time in many years on Feb. 1. The Legion has teamed with the Galion Community Foundation as its charity of choice. Between now and Easter, the Legion also is collecting canned goods in support of local food pantries. Anyone interested in donating non-perishable items to this cause may drop them off each Thursday from 4:30-9 p.m. at the Legion Banquet Hall/Activity Center. Bingo participants exchanged a canned food item for a free Bonanza Game card during our March 1 game. Legionnaires are working on additional projects to assist the community. Some of these will be announced soon. Veterans, spouses — and in some cases family members — interested in joining the American Legion may call Scarbrough Post 243 for more information at 419-468-1208. Courtesy photo Ken Green, financial officer of American Legion Post 243, presents Dave Spraw, of the Galion Community Foundation, the initial monthly check. The February check was for $800. https://www.galioninquirer.com/wp-content/uploads/sites/38/2018/03/web1_GCF-Pic-2.jpgCourtesy photo Ken Green, financial officer of American Legion Post 243, presents Dave Spraw, of the Galion Community Foundation, the initial monthly check. The February check was for $800.